So....after driving Rebecah my brain kicked in and I got these right. 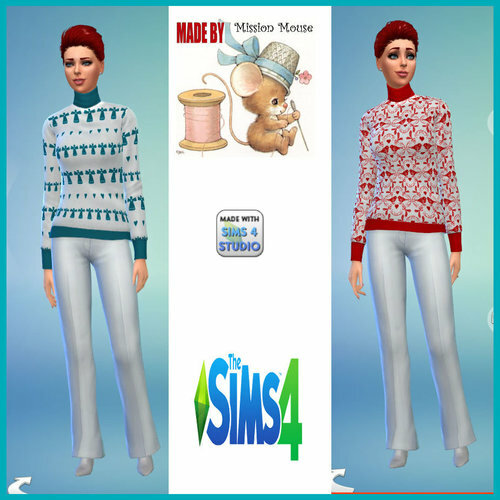 They are recolours of the Holiday Sweater using mana-tea sims patterns as inspiration. They show up correctly as one item with recolours, not individual items. 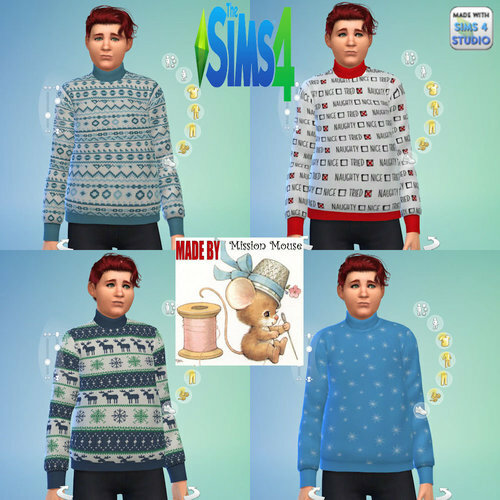 They are a match with the Male's Holiday Sweaters using the light colours for the women and the darker colours for the men. They should be pretty toasty for the Winter Season and I hope your Simmies like them. 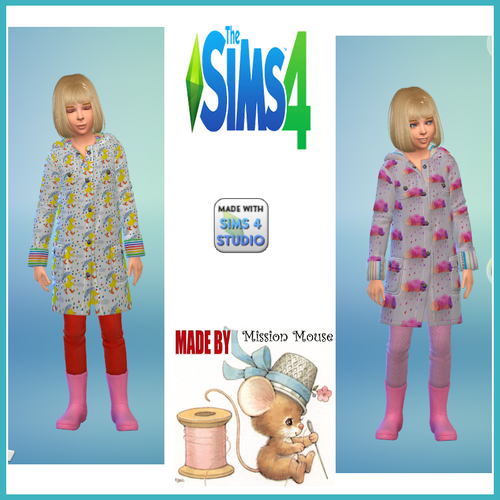 A huge to mana-tea Sims for the inspiration and to Spoonflower for the patterns. An even bigger to Rebecah for her patience in teaching me how to do these the right way. May all of you have a healthy, happy and Blessed Christmas. 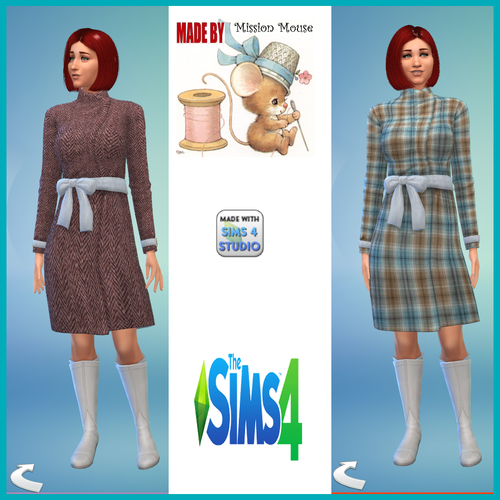 Finally, here are my recolours of the lovely Season's Sweater Dress. 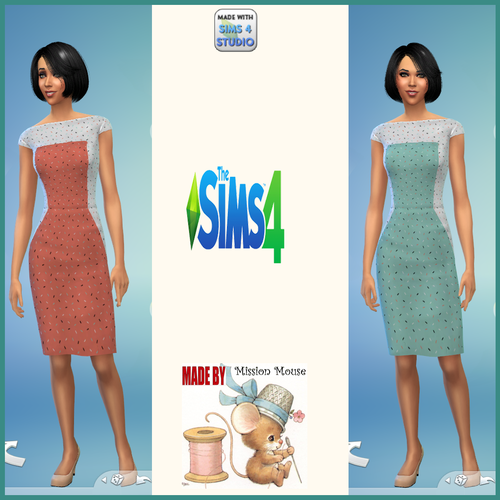 There are over 100 recolours because this dress worked with almost every pattern I tried. There are various knit designs, chevron designs, argyle designs and many others. This time I remembered to include what it looks like on elders and teens as well as adults. This coat caught my eye, to me it's absolutely beautiful. I just wanted more colours and different textures. I have all the expansion and stuff packs and this outfit was made using Sims4Studio. You will need Season's for this coat to show up in your game. 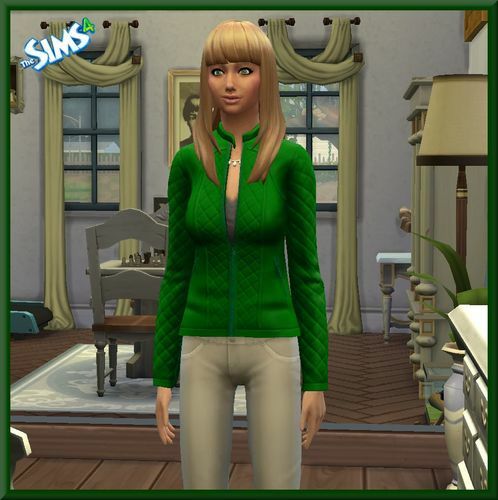 I hope your Simmies stay warm in this coat. Finally I have something! I really love the Vintage Dressing Gown, but I wanted more than solid colours. This one was challenging but I am rather pleased with the results. 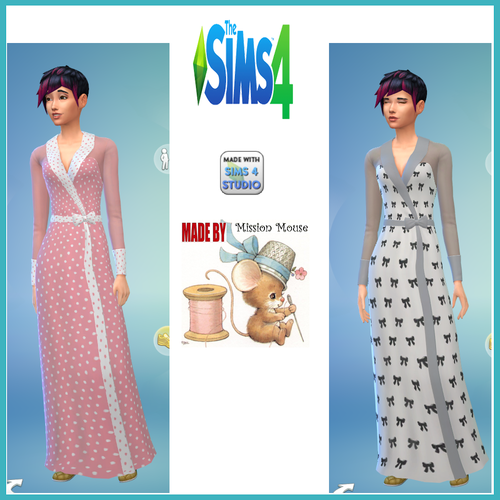 Thank you to Sims4Studio for their awesome program and to Spoonflower, where I get patterns from to use in this game. You need EP02 for these outfits to show up in your game. I know that I have previously loaded this same outfit, but these are NEW patterns. This is seriously my FAVOURITE outfit in the game. I use Sims4Studio to make my creations. Please let me know if you have any issues with this outfit as something wonky happened that I did, but all of these do show up in my game and they do work. 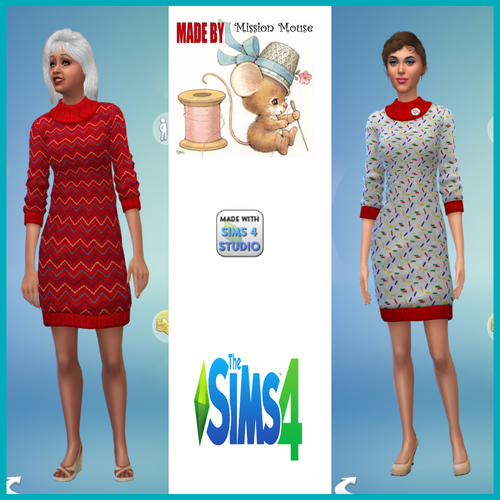 The swatch images show the 2 patterns , side by side and they are the ones I put together to make one outfit. I absolutely love this outfit. The combinations one could use for it are practically endless. I tend to prefer the contrasting patterns but they are a tad bit difficult to find. You do not need a mesh as this is an in-game outfit. Once you download it, you can do whatever you want with it....don't have a colour you want in one of my patterns, change it. If you want to learn how, PM me. Most of all, have fun with them!! 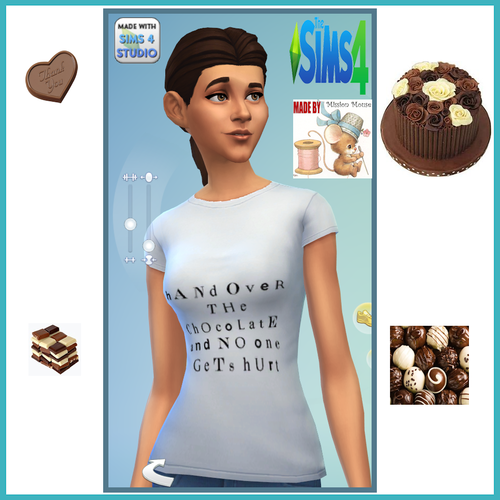 My very first Sims4 outfit upload! This is a Base Game [BG] re-texture of the Belted Dress. I say *re-texture* because I don't consider this a recolour. To me a recolour is simply changing the hue and saturation, a re-texture is entirely replacing the pattern. I will always tell you what expansion or stuff pack the outfit comes from because I have all of them so far. for their program that made these possible. If anyone wants to learn how to make recolours or re-textures I will help as much as I am able. It really is ridiculously easy. 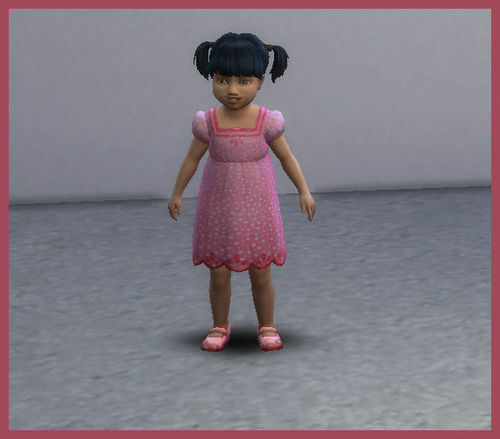 My first toddler dress recolors for Sims 4, all 5 dresses are in one stand alone file. 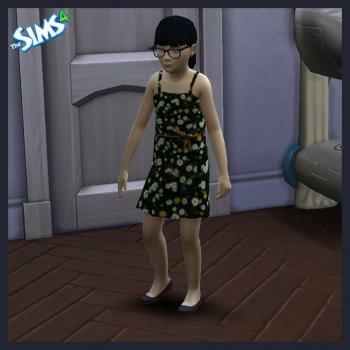 I do not understand why EA saw fit not to include toddlers a long time ago. 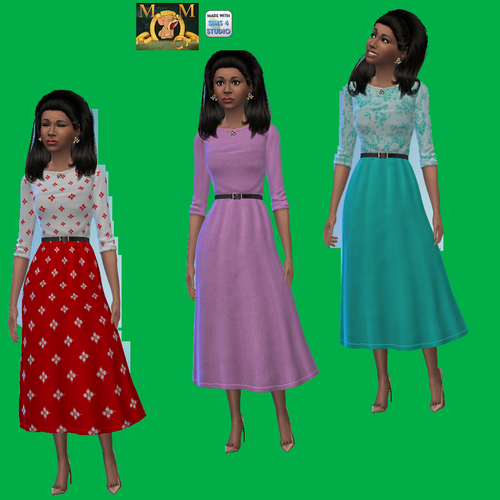 4 Female Child Dress recolors for Sims 4, these are a stand alone recolor, all 4 recolors are included in one package. Place the attached file in your ..\Documents\Electronic Arts\The Sims 4\Mods. My first Sims 4 creation. 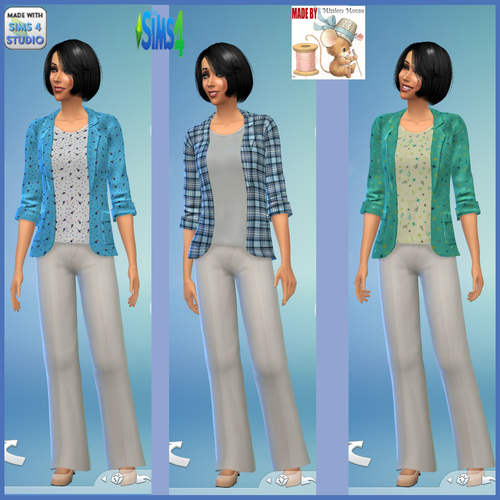 I was experimenting with Sims 4 Studio and created 4 recolors of this top. They are just hue adjustment colors, and it is a stand alone item, as I found that was the only way to get them to work in game. 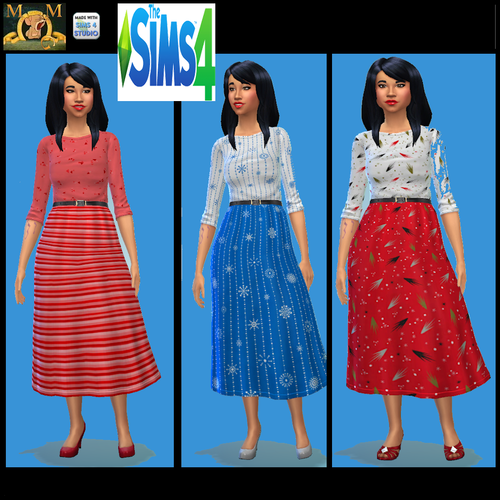 Recolors of Clothing and CAS items seem to be very easy to do thanks to the Sims 4 Studio.